The-Guy-Who-Knows-A-Song-About-A-Chicken has a hobby that's going to get us food. 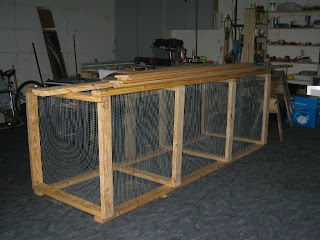 I have a hobby that's going to get us shot by some guy with a chicken in his yard. See? 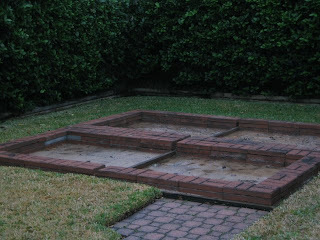 The-Guy is making a vegetable garden. And he's making compost bins to recycle our garbage and feed the veggies: I, on the other hand, am driving around Houston taking photos of people's misery. 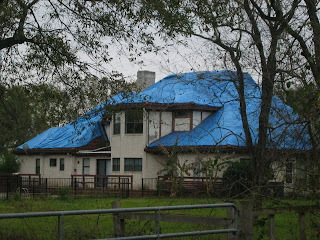 It just flat out amazes me that so many people still have roofs covered in blue tarp. 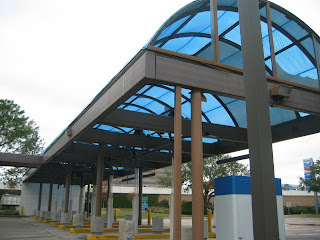 Is tarp really sufficient to keep rain out for four and a half months? 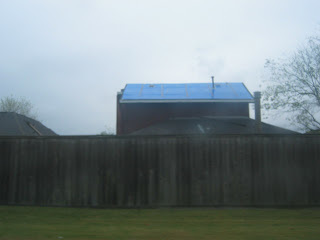 And if so, why the heck do we even bother with shingles? 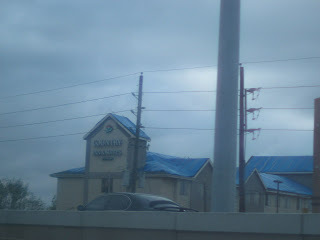 To give credit where credit is due, those pictures which seem to be taken from a moving vehicle were taken by my gal, since I didn't feel like killing us off just so people could see the blue tarps of Houston. I mean, I've risked life and limb for this blog before, but I figured what the heck, she was already in the back seat and didn't particularly feel like dying either. Hope everyone is having a tarp-free and possibly not even blue Christmas (although as I understand it, other parts of the country are having their own weather related problems) and a happy Chanukah! I can imagine the cost of fixing the roofs can be pretty steep. But if tarp is sufficient to block out the rain for that lone, why not? The blue does look nice I have to admit. Also if you want the feel of living in a tent you just need to go to the attic. If you could make your pool look like a beach and the a basement like a cave that's three vacations right in your house. Happy Chanukah! Maybe you can explain the difference between Hanukkah and Chanukah. I'm amazed how neat those tarps look. If I put up tarps, they'd be crooked and off and flapping around. Nice hobby that GWKASAAC has. Veggie gardens are fun. Until you see the tops of your carrots and radishes wiggle and whoops! disappear as a gopher drags it down into it's lair. Or den. Or hole actually. I've seen this happen to my veggies. But you're in Houston and used to varmints. 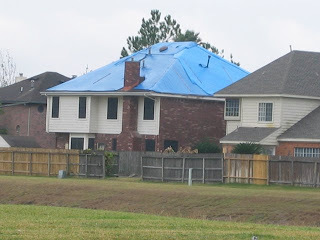 Well, at least it looks as if the blue tarp manufacturers aren't suffering too badly in the current economic clime. Now I have Elvis stuck in my head. I think this is a good example of your government working at the least common decnominator. 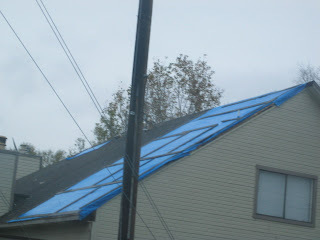 I know of contractors that were hired to put up those blue tarps. To the tune of $5,000 a house, flat rate. 10 sq ft of tarp = $5,000, 100 sq ft of tarp, $5,000. That was the quick and easy way for FEMA to quell the masses, getting around to spending the real money on repairing the roofs....well, that is the public sectors problem....you fix it, and send the governemnt the bill and they will....think about it. 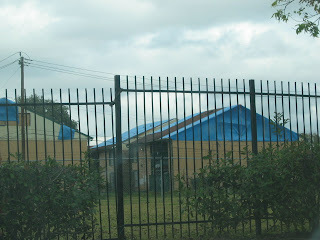 Final lesson....if you trust in the government, you get a blue tarp. If you trust in yourself and have some saveings, you get a new roof. Happy Chanukah and Happy New Year. SJ - Doesn't it, at least on the bank? We can't do the basement thing though - Houston doesn't have basements. Ms.Q - The answer is: it doesn't matter how you spell it. The word is transliterated from Hebrew which uses different letters. You get to spell it however you want. I like to spell it with 8 letters because I heard one time you should for the eight nights. I imagine only the nicely put up tarps are left. There are also plenty around town bundled in a heap on one corner of the roof. On those I figure their stuff MUST be wet! Free Man - Yeah, they look like they're doing okay, don't they? I also sort of wonder if it's a great time to be a manual laborer in Houston ("great" being relative and all). Bruce - Wow! That's some expensive plastic!!! I think in addition to FEMA gumming up the works, there's the insurance being slow and I believe that it's been hard to find enough people just to do the work. I have a friend who is still in an apartment because although she is not relying on FEMA she has had to wait on the other. Thanks Kerry! And happy New Year! 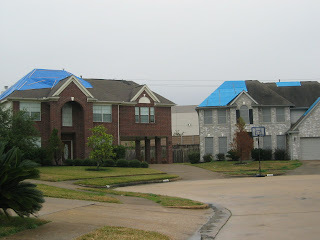 Wow, it is hard to imagine living with tarps all this time. Makes a person appreciate having a dry roof, that's for sure! Just stopped by to wish you and yours the happiest of new years!! Thx for all the smiles this past year! I call this album of blue tar phage! Hey your girl did great on those photos! 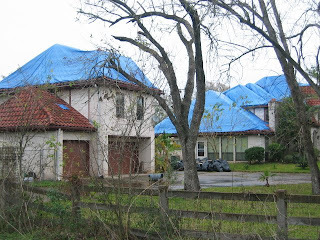 Wow - that is a lot of blue tarps. 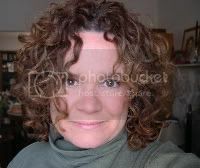 Janet - I SO appreciate my roof!!!! I LOVE having a roof! 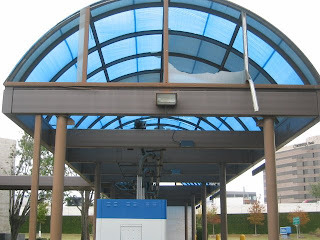 Especially one that keeps the water out without the help of blue plastic. And happy new year to you too! Funny Roger, and thank you! Isn't it Alf? And I just took a few pictures. We pass them all over!